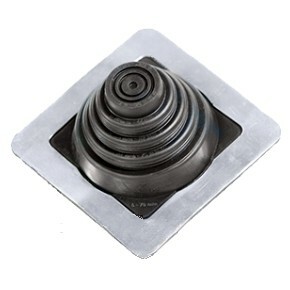 #1 BLACK SILICONE Rubber Flashing Boot, 4.5 x 4.5 Inch Square-Base, 2-1/8 inch High, Closed Top. Fits 0 to 2 inch OD Pipes/Rods (0 - 50mm). Price/Each. MINI-3, BLACK SILICONE Rubber, 4x4 Inch Square-Base Flashing Boot, 1.75 inches High. Fits 0.02 to 1.75 OD Pipes/Rods/Wires. Price/Each.